Are you looking to save a little time and a little money in the garden? If so, take a look at these 15 brilliant gardening hacks certain to do both! When you give these gardening hacks a try, you can grow the garden of your dreams with less money and less time. Who wouldn’t want that? Here are 15 great ideas to get you started! 1. Let your wine bottles water for you. Fill a wine bottle with water and turn it over, pressing it deep into the soil. The wine bottle will water the soil as needed, saving you a little time and hassle. 2. Save your egg shells. Egg shell halves not only make great seed starters, but crushed egg shells in general can be used to enrich the soil and feed your plants. Just stir it in as you would fertilizer pellets. 3. Try some milk jug magic. Milk jugs make excellent watering containers, and they can also be cut into easy to use scoops. You can even save the bottom halves for seedling containers. 4. Grab some glow in the dark paint. Use glow in the dark plaint to paint rocks which you then use in your garden borders. It will help you see your garden even at night. 5. Let lemon grass protect you. Plant some lemon grass in your garden to help keep biting bugs at bay. Citronella plants are also perfect for this task as well. Plus, both are attractive and can add beauty to your garden at the same time. Pour boiling water over weeds to kill them without the use of chemicals. Only pour this on weeds, as it will kill grass or plants as well if it comes in contact with it. Make a mixture of water and cayenne pepper to spray on plants and help prevent pests that would prefer to dine on them. 8. Make your own garden markers. Forget buying garden markers, instead take wood craft sticks coated in chalkboard paint make the perfect garden markers. 9. Call the butterflies to your garden. Bring the butterflies to the yard when you place out some fresh fruit or shallow dishes of sugar water. They will help pollinate as well as add beauty. 10. Stir in some coffee grounds. Stir in some coffee grounds into the soil to help balance and nourish it. If you don’t drink coffee, ask a local coffee shop for theirs. 11. Try some marigold magic. Try planting marigolds around the border of your garden. It will keep rabbits and other pests that would love to dine far away. 12. Save those citrus peels. You can save citrus halves to use as seed starters, or save the peels and use them to repel ants. They can also add nourishment to your soil. 13. Keep your tools clean. Keep your gardening tools clean and prevent rust when you store them in a bucket of sand. Just press the end of the tool into the sand until needed again. 14. Keep your nails clean. If you can’t wear gardening gloves, try digging your nails into Vaseline or soap. It will fill in the underneath of your nails and prevent dirt from getting in them. 15. Turn an old hose into a sprinkler. Take an old hose and poke holes all over it. Place it in the area of need and turn on. Water will shoot out from the holes making an instant sprinkler. 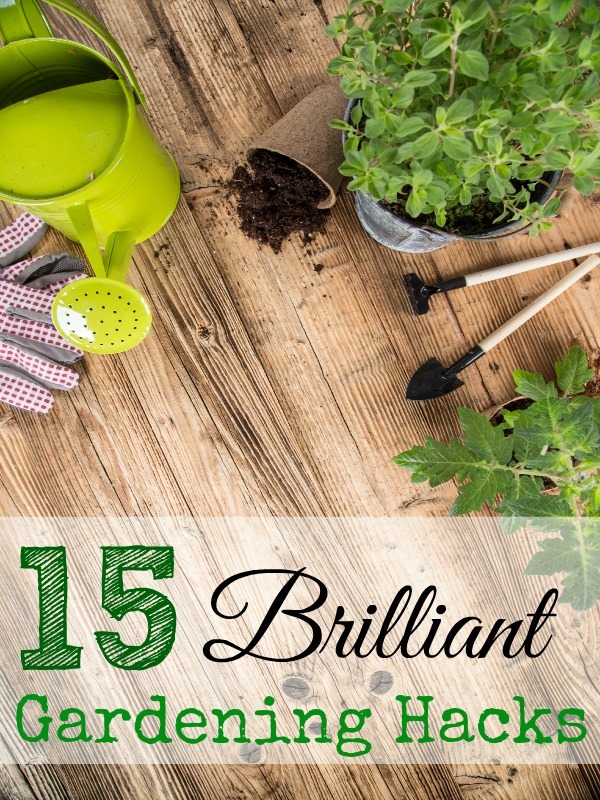 Gardening can be fun and easy when you give these 15 brilliant gardening hacks a try! Which one are you excited to try first? Great advice, just started the season for the garden and I will definitely use most of them, I’m waiting for more such entries. I also love these tips! I’ve been wanting to get outside to plant, but it has been raining all weekend! Better luck next week I hope! I’m excited to read all of them! I’m going to be doing a small square garden this summer so I’ll be using a lot of these tips!